Check out the latest line of Red Dawg Nozzles! We offer a seven-day money back guarantee from the day you receive your nozzle so you can purchase with confidence. You can buy online or through a Red Dawg Representative. To find your rep or visit our online store, check out the links in the upper right-hand corner. Stop jetting blind! With the Red Dawg Scout, you can see exactly what you’re facing inside that line. Embedding an action sports camera, that is built to be waterproof and durable, inside the body of an aluminum nozzle allows you to clean the line while you camera. Once you have recorded, pull the nozzle back and review what you’ve record on any phone or device. Sewer cameras can be expensive both initially and to maintain while also containing complex electronics that are difficult to repair or replace. 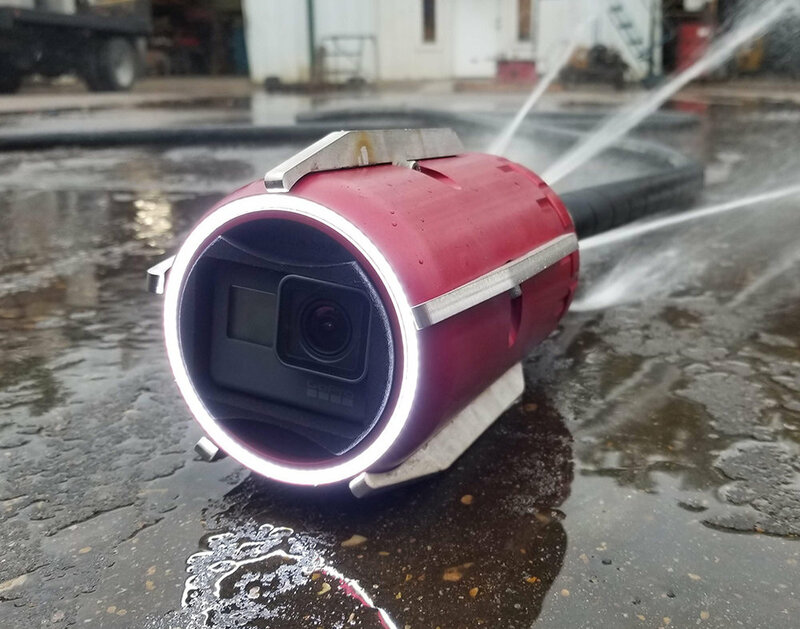 The Red Dawg Scout is a low-tech, cost efficient sewer camera that any operator can rely on. 55 Pounds! That’s how much this mammoth of a nozzle weighs! Regardless of the size of the culvert or the level of debris, this nozzle is up to the challenge. 12-rear jets with enhanced stream technology give you a tight jet stream at three different angles. Like the idea of the Texan, but don’t have a 1” machine to run it on? The Texan-Lite is the answer you are looking for. The Texan-Lite features the same 12-jet pattern with enhanced stream technology. Weighing at just over 22 pounds, the Texan-Lite is available for 3/4” systems and the aluminum version comes in at under 10 pounds making it an option for virtually any sewer jetter! A sewer nozzle developed around a hydro excavation tip gives you ultimate penetrating power. The Root Dawg has eight rear-jets and a body built around a HydroFlex Ripsaw HD. Cutting through mud, grease, roots or any other sort of debris are no problem for this nozzle. For slow-mo video check out the link below! This is a fantastic nozzle for resolving lateral and small line stoppage issues. We utilized the Ripsaw body and added rear thrust. Find out more at the link below. Line locating in a pipe can be difficult but the Bloodhound makes it easy! A 512 hz sonde built into this nozzle can reach depths of over 30 feet below ground. 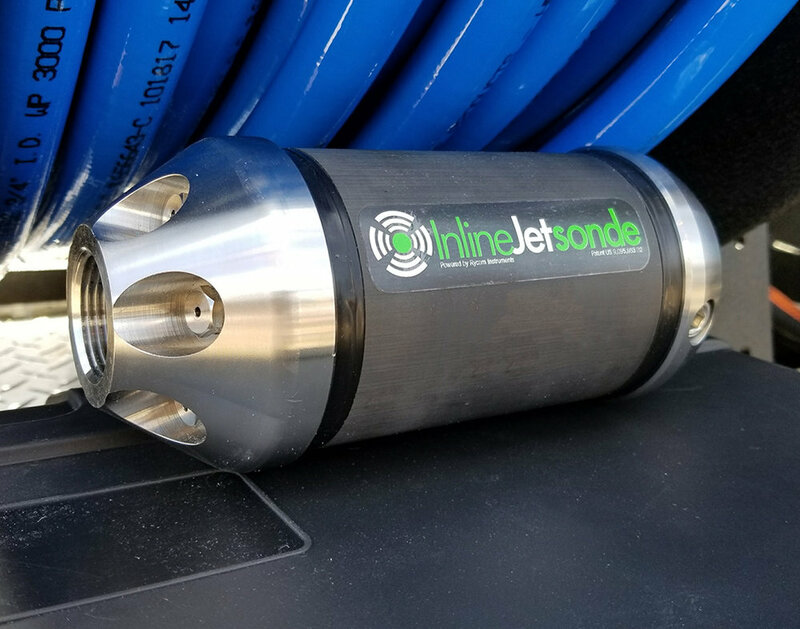 Just attach this sonde nozzle to your jetter hose and use any locator to follow and track the line. 60 gpm or larger jetter required to run this nozzle. The name says it all. Sanitary cleaning will be a breeze with our Hero thank to 12 rear-facing jets. A wide spray pattern gives you ultimate cleaning power in sanitary lines. Our 10-Jet Nozzle comes in two different sizes based on the application and the size of your jetter. Our small 2.3” jetter nozzle is perfect for sanitary lines and 1/2” or 3/4” units. Our 3” diameter 10-Jet is tailored towards jetters capable of 40 gallons per minute or more and are the perfect tool for storm drains. Weighing nearly 20 pounds are large 10-jet is great in lines with heavy debris. An aluminum body sets this nozzle apart from the rest. Thanks to its lightweight the application for this nozzle is wide spread and can clean weak lines, lines fill with sand, lines on a steep grade or just general sanitary cleaning. Our users on the east and west coast dealing with sand have fallen in love with this nozzle. An industry classic made with American steel. This chisel nozzle, available in three sizes, is ready to help you tackle any blockage you come up against. Grease build ups are no problem for this nozzle and our chisel will have you back at full flow in no time! Another classic sewer jetting nozzle is our six-jet Hot Dawg. Made with stainless steel, this nozzle comes in two different styles. At 2/3” diameter this nozzle is available in 1/2” and 3/4”. At 3” diameter the weight jumps to around 20 pounds and requires 1” or 3/4” hose to jet efficiently. The name says it all … this low profile sewer jetting nozzle is great for small dimension pipes or service lines! Six rear jets clean the walls of the pipe while three forward facing jets give you a power stream up front to break through blockages in the line. Available for 1/2”, 3/4” or 1” jetters. This floor-cleaning nozzle is great for box culverts or storm drains. Built with a rear swivel that guarantees this nozzle will lay flat on the bottom of the pipe, our Mud Dawg comes in two different styles. Whether you use the six-jet version for 1/2” and 3/4” jetters or the 10-jet version for 1” and 3/4” jetters, the Mud Dawg is up for the challenge! If you are looking for a wider spray patter across the floor of the storm drain or culvert, Mud Dawgs can be paired in tandem and run side-by-side! Our drilled nozzles are cost-efficient and are a great option for general line cleaning. We offer drilled nozzles in 1/2”, 3/4” or 1” designs and each features six rear-drilled orifices and we have the option of a single front orifice.